“Every movie has a hero. This one has them all.” There couldn’t be a more broad-based statement of low-expectations ever uttered for a movie tagline. The Movie Mind shouldn’t have been surprised at the quality of the film spawned from a statement like that, yet here I am, shocked at the sheer gall it took to put this flaming piece of garbage onto the big screen. I have been a proponent of Stallone throughout his entire career and have felt strongly that he has consistently been underrated as both an actor and writer. Unfortunately, this is how he repays me for that loyalty. I have to say that there is just no defense of The Expendables. Keep in mind, this is coming from a guy who defended Oscar, Cop Land, and Stop! Or My Mom Will Shoot. I wasn’t exactly expecting an Oscar-worthy film here and it still managed to underwhelm in every single aspect. Let’s be honest about something upfront; how many legitimate action “stars” were really in this film? Stallone, Schwarzenegger, and Bruce Willis: check. The problem that arises there is that between the governator and Bruce they account for about 25 seconds of total screen time. Basically, it’s as if they weren’t even there. Apparently both were unpaid for their appearances and did it as a favor to Sly. They could have done us all a favor and said no to him. We’re left with Sly who is certainly a bonfide action star but in all fairness is on the downside of his career. Then there is Mickey Rourke who is a big time star, but not really known for action films. Move down the list to the second tier (aka J.V.) guys: Jason Statham and Jet Li. Each has had a couple nice action flicks, but if you happened to be in a Sri Lanka for the last 5 years with no access to a movie theater, you’ve probably never heard of them. That leaves us with the leftovers: Dolf Lundgren, Steve Austin, Randy Couture, and Terry Crews. Aside from Rocky IV, not a single one of these guys has been in a legitimate film. Lundgren’s days of looking like the Siberian Express, Ivan Drago, seem like a lifetime ago. That dude has apparently lived a rough life since then. The WWE and UFC champs need to keep their acting chops inside their respective rings because they are brutal. Aside from the fraudulent “all-star” cast, there are so many other areas thoroughly lacking that no onscreen performance could have saved this film. They are a random group of supposed mercenaries with no back-stories or explanations of who they are or why they happened to be in that line of work. Are they ex-CIA or military? Maybe they just happen to be a bunch of bad dudes. Ok, but how do they know each other? For all we know, they used to ride the same bus to school. 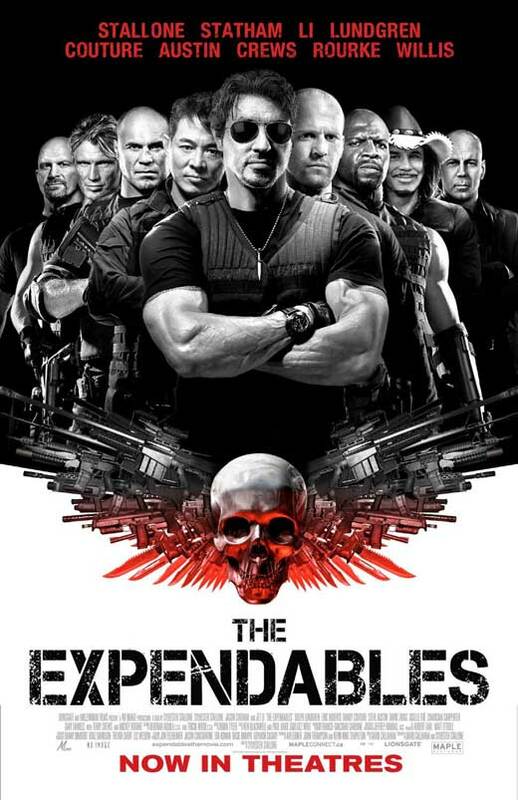 Now even with all of those minute details left out, I know that there would have to be an almost shameless plug of where the name “Expendables” came from…only there wasn’t a single peep about the name or people. If you might wonder about any of those little things that would equate to some form of plot, then this is not the movie for you. You might say, “Ok, who goes to this movie expecting a good plot anyway?” Right you are. I shouldn’t harp on that too much. So then there must have been some unbelievable action scenes, right? Once again here comes the pie in the face: the action sucked just as much as the lack of a plot and forgettable characters. There were a few scenes so pathetic it was laughable. I think the only worse bit of news I could give you is that they have apparently given the green light to an Expendables 2. I sincerely hope some small bit of poetic justice inspires a group of real-life mercenaries to go and take out anyone even remotely considering appearing in that film. Interesting Cameo Appearance: Considering every single role in this film was nothing more than a drop-by cameo appearance, I’ll pick Arnold Schwarzenegger (the former action star and current gover-nator who found time in his busy schedule of bankrupting California) as Trench, a random rival mercenary who shows up in a random scene with Bruce Willis’ random on-screen appearance. Gunnar Jensen: What do you wear, size 3? Bring it, “happy feet”! Lee Christmas: What’s he sayin’? Hale Caesar: He said we’re dead, with an accent! Barney Ross: What the hell’s he doing? Barney Ross: Don’t be ridiculous. Gunnar! What are you doing? Toll Road: That’s seriously demented. Trench: Have you been sick? You’ve lost weight. Barney Ross: Whatever I’ve lost you’ve found, pal.